Flavor is the product of maximized potential. In the kitchen, that means preparing high-quality ingredients in a way that draws out the most—and most appealing—flavor and artfully combining those ingredients so that synergy makes the flavors sing. On the farm, flavor comes from choosing crop varieties and animals that have good genetic potential for flavor and providing those crops and animals with the raw materials, growing conditions, and handling they need for flavor production. 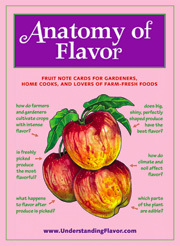 In pursuing the connection between farming and flavor, I spoke with farmers in California (Mike Benziger, Bob Cannard, Rick Knoll, Paul Muller, and Tom Willey), New Jersey (Susan and Ted Blew, Ed Lidzbarski, Gary Mount, Jess, Niederer, Chip Shepherd, and David Zaback) and New England (Dan Kittredge and Cheryl Rogowski), as well as chefs (Christopher Albrecht and David C. Felton) with farms right outside their kitchen doors. Most began by talking about the soil. For these farmers and chefs, the flavor of produce, meat, and dairy begins with well-functioning soil biology combined with a broad selection of naturally derived nutrients. In addition to soil health, varietal selection, timing of planting, environmental conditions, timing of harvest, post-harvest handling, and freshness at market were mentioned as factors that contribute to flavor. In the coming weeks I’ll summarize the interviews here, using each to highlight a different aspect of flavor production. These interviews have a unifying theme: that quality and flavor come from looking to nature for guidance on how best to manage fields and livestock. Another common theme is the importance of combining skill and good information—whether gained through careful observation or scientific analysis—to manage the many interwoven factors that lead to flavor. This entry was posted on Tuesday, June 28th, 2011 at 3:29 pm	and is filed under Cultivating Flavor. You can follow any responses to this entry through the RSS 2.0 feed. Both comments and pings are currently closed.